Put a group of women with small children together and I can almost guarantee a conversation of sleep, or lack of, will be brought up. In my experience, it can be a touchy subject. I’ll go ahead and say that I whole-heartedly believe that there is no one right way. As with every element of parenting, you have to do what works best for your family. To me, letting your kids cry-it-out seems to be on one end, while co-sleeping with your little one is on the other. I know AMAZING mamas on both spectrums, and I also know that these aren’t the only 2 options. There are probably a million ways to manage your baby’s sleep. As for me, I’m torn. I love the idea of teaching independent sleeping at a young age (with the hope of them sleeping all night). And I equally love the idea of co-sleeping. How’s that for indecisive? I’d go even further and say that even though I’ve raised 2 little people, if I get to have another one… I have no idea how we will manage their sleep! I guess we will just roll with the punches, and go with what seems best at that time. I will forever love this old photo. 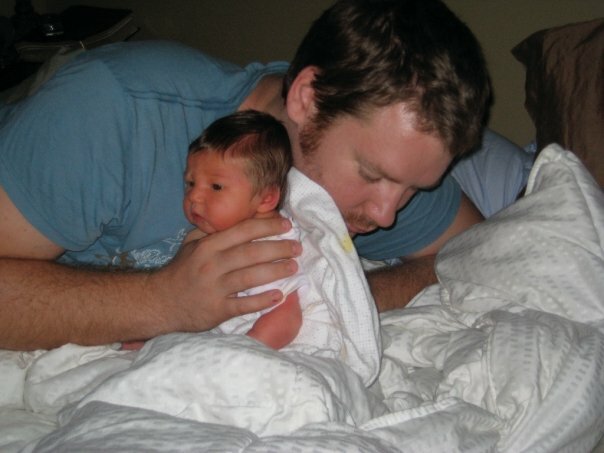 It’s my oldest son when he was about a week old, and my husband literally fell asleep while holding him up. It just so represents the joyful exhaustion we were all feeling. My first year of motherhood is pretty foggy. I got a lot of conflicting advice that year, and ended up trying several different sleeping approaches. I only remember 2 things. One being that we didn’t co-sleep and the other being that at around 13 months we let him cry-it-out a few nights which led to him sleeping through the night. When we had our next baby, both my husband and I thought a little co-sleeping would sweet. We gave it a go, and it was in fact special. 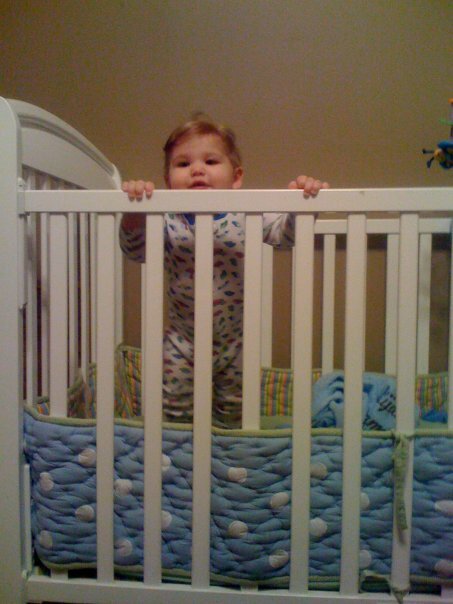 Typically, he would take all his naps in his crib. I would nurse him and then lay him in his crib where he would fall asleep easily. In the evening, I would also put him in his crib. In the middle of the night he would end up in our bed, and it was a special bonding time with David for both my husband and me. I slept great knowing he was right next to me. I have heard the other side of that argument and I get it. But for us, it was good. It was good, that is, until he started crawling and managed to wiggle his way off the bed twice. Once that happened, we nixed the co-sleeping. Not much changed except that in the middle of the night when he would wake up I would nurse him and then lay him back in his crib. He was waking about 3-4 a night. So, our little guy is 14 months old and not much had changed. He was still waking a lot and would nurse for 30 seconds and then be back to sleep. I feel like it had gotten to a point where I just couldn’t physically keep it up. I never, ever woke up feeling like I got a good nights sleep, which is probably because I never, ever got a good nights sleep. So we bit the bullet. My husband and I were on the same page and decided we were going to let him cry it out for a few nights in hopes of changing his sleep habits. Night one was by far the worst. I slept downstairs, and John slept in our room with David (where his crib is) just so he could make sure David didn’t get too worked up. He cried most of the night. The next night, David still woke up a few times, but he only cried for about 10 minutes. And then night 3 he just woke up once and cried only a few minutes. It’s been a week since night 3 and David has continually slept almost 12 straight hours each night since. It’s fantastic! But here’s the thing… I absolutely don’t regret waiting this long before I let him cry-it-out. As I mentioned in this post, I have logged hundreds of snuggle hours with David. Hundreds. And I am so thankful for those. And here’s the other thing… this week David has been in a great mood every day. I really believe the uninterrupted sleep has done him good. UPDATE: I wrote this post last night before bed, and let me just say that mama has been in high demand the last 8 hours. The minute my head hit the pillow the little one woke up with a startling IJustHadABadDreamCry, so I had to get him. My plan was to just hold him and calm him down, but not nurse him. So we snuggled and sang, and 20 minutes later I thought he was sound asleep on me. Next thing you know he sits up, lets out the most pathetic whimpers and then starts pecking at me like a chicken. I caved immediately and nursed him. I got him back in his crib and then my 3 year old decided to wake up 4 times in the next 4 hours needing things like cover adjustment, water, potty and a flashlight. So.. that was fun. He is a great sleeper, and he never wakes up like that. It was almost laughable that this all went down minutes after I wrote this. At least I never claimed to be an expert. And in case you are wondering, I have read several research articles on the different sleep approaches. I have read the convincing articles on why its important for young children to have uninterrupted sleep, and I have read the equally convincing articles on the benefits of co-sleeping. So I just want to reiterate that I really, truly don’t think there is one right way. So moms… let’s have grace for each other. We might do things very differently than the next and that’s okay. Also remember, every child is different, and different sleep situations might work best for different children! I’d love to hear what worked for your family! P.S. 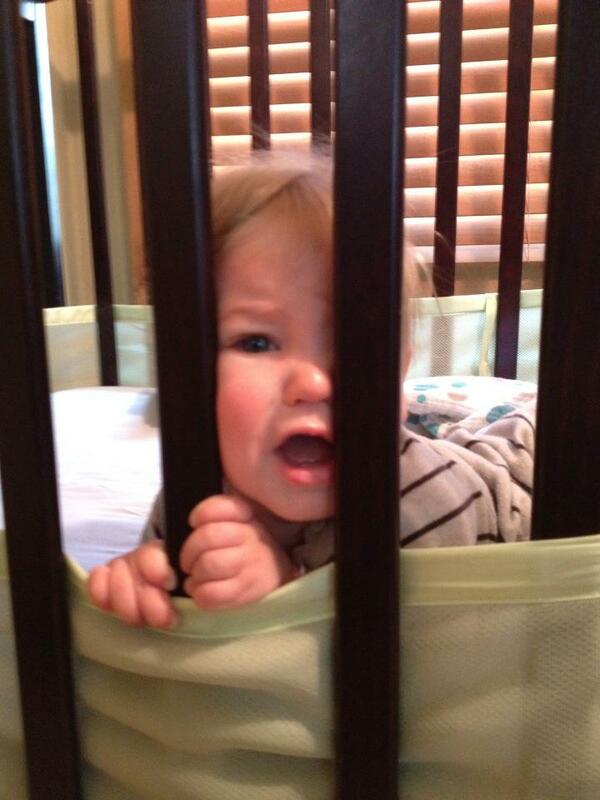 I have heard some people (I’m assuming pro co-sleeping people) mention that a crib just feels too jail-like. I’m not mocking that at all, because seriously… to each their own, but I just had to include this pic because it makes me laugh. P.S.S. Don’t forget to enter to win our Whole Foods gift card giveaway. It’s super easy to sign up and remember you can enter once each day! This came at a perfect time! I have and 8 month old and well we haven’t had a full nights sleep in 8 months. It’s rough and good to know I’m not alone. Marisa… I’m glad to know I’m not alone too, and ultimately was my purpose behind this post. I just want mamas out there to know that just because their baby might be doing things differently than another… that’s okay!! Hope you are doing well!